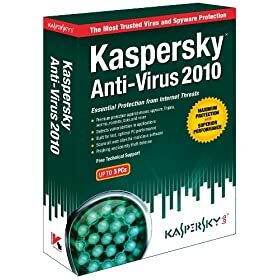 Kaspersky Anti-Virus 2010 offers the most trusted virus and spyware protection with the essential protection you need to protect against Internet threats. When you buy Kaspersky, you get more than just a box of software. You’ll benefit from unique technologies that deliver the best protection, performance, and security utilities available. Raise your defenses against the ever-increasing threat of cybercriminals!